I had some bananas going bad that were sitting on my countertop and needed to use them up! I resorted to one of my favorite cookie recipes, my banana cookie recipe but wanted to put a delicious spin on it… of course, I resorted to Nutella! These cookies were DELICIOUS! The moistness of the banana cookie with surprise streaks of Nutella made them perfect! Do you have bananas starting to go bad? !… Give this recipe a try! You will be glad you did! These cookies are the perfect way to use up some ripe bananas! They taste amazing! Sift flour, sugar, baking soda and salt together in a large bowl. Beat in mashed ripe bananas and egg. take a knife and "slice" nutella into batter with a knife. Don't mix it in completely, the stripes are what make them pretty! You can frost these cookies if you would like too! Here is my easy buttercream recipe: ½ cup butter-softened, 3 Tbsp. milk, 2 tsp. vanilla, 1 box (16 oz.) powdered sugar. Beat all ingredients together. You can add more milk or powdered sugar to get it to the consistency you want it. Oh wow - what are you doing to us?! My husband would LOVE these. I have the same question about the shortening - can something else be used in it's place? I can't wait to make these cookies!! Option to substitute for shortening?! Recipe sounds delicious! Can you use anything in place of the shortening? Streaks of Nutella in anything makes me very happy, but in a banana cookie it is even better!!! These look fantastic!!!! What a wonderful recipe. Each time I have rip bananas I make muffins or bread, all the time...so this is an excellent recipe to have a variation at home. And who can resists to Nutella??? Thanks so much Nikki to share it. This looks like a great way to use up old bananas! Just gorgeous and they use 2 of my faves in one: bananas (ripe)- always need to find a use AND Nutella...mmm!! MmmmM...I think I need help...I'm addicted to nutella and this may ruin my recovery! LOL! Nutella and bananas were made to got together! Yum! Made them today for my families lobster bake! My dad loved them! These look sooooo good but I have the same question about the shortening could something else be used? Thanks!! Just cooked these ... OMGoodness! They are super yummy! The only thing I did wrong was to over stir in the nutella ... Next time I will carefully cut it in to make the pret chocolate streaks.. Other than that - yumminess! Just made these, and they are incredible!!!! A combination of banana bread, muffin tops, and cookies. Substituted the shortening for 3/4 cup of smart balance light, and they tasted great! I made one batch of small sized cookies and only cooked them for 6 minutes (I might even suggest 5 minutes). I made another batch of cookies that were a bit larger in size and cooked them for 8. For those of you asking about a substitute for shortening, I used just under 1/2 cup of applesauce in its place. The texture is probably a bit different without the fat, but they are still very good! I made these cookies today, so good! Thank you for posting the recipe! Just made these and they are DELICIOUS!! I am always hesitant to try a new recipe that doesn't have a lot of reviews/comments (don't like to waste ingredients) but boy am I glad I tried these. My three year old son helped and I keep catching him in the kitchen stealing cookies now that they're done! Made with whole wheat flour also and can't imagine they're any better with white flour. :) Thanks for the recipe!! I think she means "Drop dough by rounded tablespoonfuls". Does that translate ok? I DO have 2 bananas that I almost threw away this morning...cookie time! No nutella but peanut butter and chocolate chips instead. YUM! Thanks for the inspiration! Nutella makes any kind of chocolate dessert more decadent. Just made these and ooooh my gooooodness... They are so tasty! Yummm! Thank you for the recipe! By ripe bananas do you mean bananas with brown spots or completely brown ? Good recipe! I added a teaspoon of vanilla and half a cup of Nutella. I made these with Earth Balance margerine, a healthy margerine, instead of shortening, not healthy & they were yummy! Old fashioned oats or quick cook oats? These are so pretty and taste great, Thanks. Easy too. I just made these and they are delicious!!! They're like a cross between banana bread and chocolate chip cookies. Although next time I'll probably use half of the sugar or none at all. The bananas and nutella are enough sugar for me....but it's absolutely up to everyone's taste. I can't wait until my husband gets home and tries these. Janet, how much butter did you use -- same amount as shortening indicated in the recipe? Thanks! How much butter did you use? I plan on making these tonight! :) Thanks! Thanks for the tip about the frozen banana, I'll keep that in mind for the next time I try these. I also used butter instead of shortening and they were awesome. When I make these cookies, they seem to either spread out too much or burn on the bottom. Do you know what I am doing wrong? I made these yesterday and everyone loved them. They are so different which is what makes them good. Not hard to make at all. Definitely making again. Thanks for sharing! Made these this morning, they are soo good. I read some of the comments here and tweaked them just a little. I used 2 cups of oats and the cookies are a little firm not at all runny. I also cooked them on parchment paper, not a fan of cleaning cookies sheets. Thank you. Just tried this..Use margarine instead of shortening, turned out really good. Thanks for the wonderful recipes! Just made these...delicious! I used Coconut Oil in place of shortening and the cookies turned out really yummy and moist. Thanks for the recipe! I made these cookies using your measurements but creaming the butter (opted out on shortening) and sugar together then adding the wet to the dry. AND tried it with PB instead and chocolate chips. Thanks for the great banana cookie recipe! Best I've tried ! Hi melissa...i want to make these and was wondering did you add the egg and the bananas to your creamed butter and eggs befor you added the dry ? Just made this. Home smells divine. these turned out soooooo delicious my whole family loved it….thank u for sharing the recipe. I just made these and they are good. The banana is really overpowering and you can't taste the nutella. Maybe I over-mixed but even in the portions with generous nutella, the banana still overpowered. 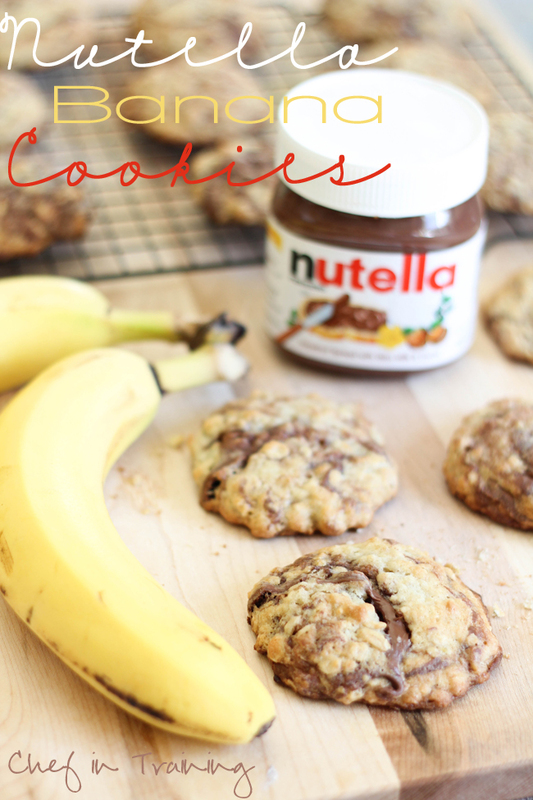 Really great banana cookie recipe but I wouldn't add nutella next time - or maybe I'll double the amount. Coconut might be a good alternative as well. Thanks for sharing the recipe! Butter can be substituted for shortening in equal amounts. WOW! These really do taste like Banana Nut Bread but in cookie form. This is the first online recipe that I've made that I've fallen in love with. Next time I'll add walnuts just to get the full Banana Nut Bread taste, I also added cinnamon and Vanilla but that's because I'm a creature of habit and I put that in all my baked goods! I will definitely bring these cookies to potlucks in the future! Also, to add I used "Cake Flour" instead of regular flour since it was all I had and it turned out perfectly. I cooked on 350 just to make sure I didn't overcook them. I substituted butter for the shortening. They came out amazing! Thank you for sharing the recipe! I would try these again but cut the shortening to half cup. I might also add an extra 1/4 c oats. I would also add vanilla and cinnamon and nuts. All of these would make these cookies better. I just made these and even though I somehow totally forgot to add the sugar (d'oh! ), they are still delicious! They are a little dry and did not flatten out (not sure if this is due to aforementioned lack of sugar) but no one in this house is complaining! As someone who is allergic to eggs, I use a ripe banana to replace the egg in baked items. Of course the banana flavor comes thru and it will be a denser item.